We arrived in Budapest, Hungary and by 2pm we pulled into the dog friendly Motel Dojo – our hotel home for the next 4 days. 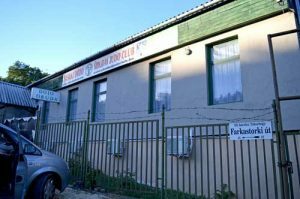 Our First Impression: horror – the outside of the building was dull gray, indicated a sports business and seemed very untended. We walked into a dark, drab building where we found someone who could speak a little English. That person asked us to wait and disappeared, reappearing a minute later with the owner. He was a very friendly man who spoke German and immediately showed us to our room. All doubt melted away when we saw the room, it looked awesome! Everything was brand new, never used. Apparently, he ran a DOJO sports hall and decided to repurpose a portion of the building for a motel. Our cost was 12,000 ft HUF per night / €39.50. It is Formula One (F1) weekend, not sure if that was reflected in the price. Although the advertising stated internet was available, it did not work the entire stay. Extremely frustrating. Dogs barked all night, half the time, right under our window. I guess they were protecting the property, so whenever anybody walked by, the barking would start. The sad part is the dogs were owned by the motel, not neighbor dogs. Sleeping in was not possible. Unfortunately, nobody was available to explain the problems to. I guess because the DOJO school was closed on the weekend, and they lived off premises, other than phoning (language barriers…) there were not any possibilies. Although nobody was available, or to be seen, on the 3rd day while we were gone somebody came into the room and left 2 garbage bags and a roll of toilet paper; they did not sweep the floor, or clean the water from the leaky shower or change the towels (from the leaky shower) or make the bed…. The shower sprayed water all over the place, but we removed a sealing ring from the shower head and then it worked great. It is very a very unfortunate bumpy start for the Motel DOJO. Too bad, as they seem like genuinely nice people; hopefully they will get it all under control. A beautiful new room is a definite asset, but it can not make a good nights sleep. In fairness, he only charged us for 3 nights instead of 4 and we hope he is able to get his hotel in order. Would I sleep here again? I would ask if the negatives have been fixed and if yes, definitely. While on our European road trip, one of the cities we stayed in was beautiful Budapest. 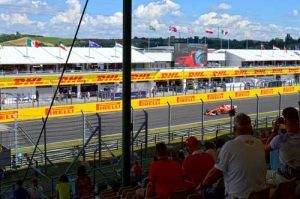 In addition to seeing wonderful sights, we had the fabulous opportunity of attending a Formula One Race at the Hungaroring. 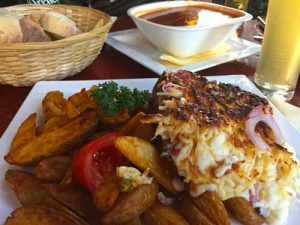 On our first evening, while looking for traditional Hungarian Goulash, we saw a busy restaurant on the side of the road. Curious, we found a parking place behind it and went in to check the menu. Oddly, although we had not seen the name of the place, it was called Pizza Paradiscom. Now, I, as a foreigner visiting Budapest would say this is a completely misleading name. The menu had a wide array of food, including many traditional Hungarian dishes – in addition to pizza. Open 24 hours round the clock, we were surprised at the large amount of families, couples and friends eating and drinking while socializing. Always taking that as a sign of a good restaurant, along with the good prices on the menu, we took one of the last tables for two on the patio. A server with a smile was came almost immediately to our table asking in very broken english what we would like to drink. I ordered a Radler (lemonade and beer mix) and my husband ordered a beer. Within a few minutes, a beer was plopped on the table and a lovely, fresh looking minty drink. I tasted it and confused, asked the server what it was, to which he replied with a smile something I did not understand. He then took the menu and pointed to a name; I quickly google translated it and discovered it was a Pear Lemonade. Naja, close enough to beer lemonade ?. Travel is great! The drink was good. 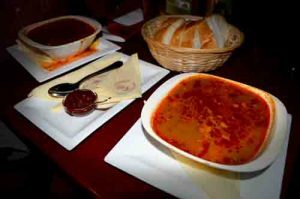 For dinner we ordered Szegedi Gulyasleves which is Goulash Soup. A big bowl filled with a hearty stew arrived, along with a wonderful spicy paste and a basket of country style bread. It was delicious! Yum yum ? The food left such a great impression, we went back 3 more times! In addition to the goulash, we tried the Pork Knuckle baked with sheep cheese. It had a wonderful flavour and texture, however, it was far too rich for my palate and I could only consume half of the serving. I would recommend a salad with it to cut the richness. We also ate a breakfast Club Sandwich on a morning when we met up with a friend along with double espresso lattes. The sandwiches were huge – had to be consumed in layers – and very tasty, the latte perfect. Great prices, great food, great service!!! Fabulous Place! Let us know in the comments below what your experience was! On our recent visit to Budapest, Hungary we happened upon a wonderful Cafe that deserves a shout out! 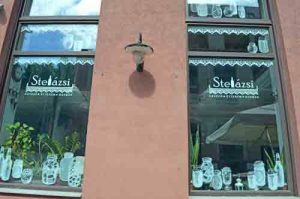 Located in the third district of the city is the charming Stelazsi Cafe, Restaurant and Wine Bar. You must visit to fully appreciate the homey, warm feeling they have created. We stopped on a beautiful sunny morning for a coffee, taking a short break from sightseeing in beautiful Budapest. 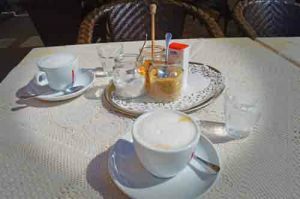 The patio seemed like a good place to enjoy or break and we ordered 2 cappuccinos, costing 450 ft / €1.50 each. Reminiscent of days gone by, the eye appealing coffee arrived complete with honey, 2 kinds of sugar, sweetener and a glass of water. The inside is decorated with a homey feel, charmingly and romantic. It was a wonderful break. Address: 1036 Budapest, Nagyszombat u. 3. 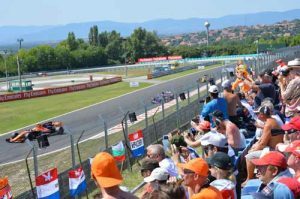 Everything you need to know about the Hungaroring Race Track. 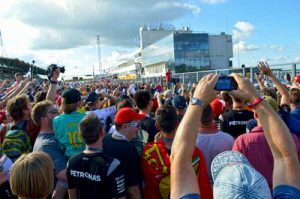 Pit Walk: It is Thursday, 3 pm and we are in a hurry to get to the Hungaroring Race Track for the Pit Walk from 4pm to 6pm. 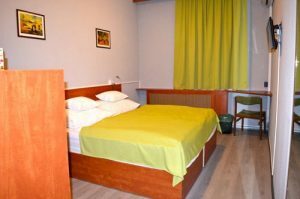 We are staying in Budapest (read the blog) and the track is about a half hour drive from our Motel DOJO (read the review). The sun is shining it is a comfortable 20 degrees celsius and we are in a long line to get into the entrance / parking at the Hungaroring, Gate 8. We finally get in at around 4:25 pm, find a parking spot – free today – and make our way to the pit, an approximate 5 minute walk. We spent 1.5 hours strolling the track, doing the pit walk and getting lots of pictures. My husband bought a race program for €15. 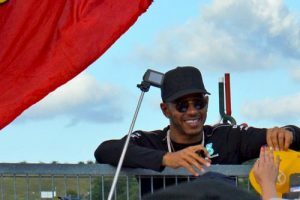 Mercedes AMG Petronas driver Lewis Hamilton surprised the crowd by showing up, shouting greetings and giving autographs. He was full of smiles and perhaps gained more fans; he was the only driver we saw interacting with the crowd. 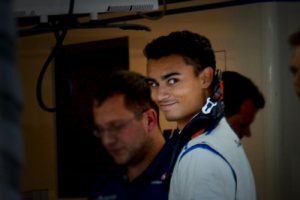 As we came by the garage of team Sauber we saw the German driver Pascal Wehrlein; my partner shouted out a hello and was rewarded with a super friendly smile. Thank you Pascal! Back at the car (6:10pm), traffic is not moving – at all. Standstill. It finally started moving at 7:50 pm and 15 minutes later we were on the highway back to Budapest. Practice Sessions: Friday – The sun is shining and it is 28 degrees celsius. We left at noon in order to give ourselves enough time for traffic, lineups and parking; arrived at the 2 pm second practice session where we had great seats in the Gold section! Very exciting! Parking was once again free, but we were a little further away this time. 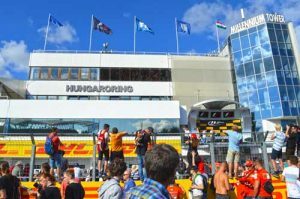 Qualifying Sessions Q1, Q2, Q3: Saturday – Parking today cost us 2000 Hungarian Forint / €6.50 – until today it was free parking and you could sit wherever you wanted, today you pay for parking and sit in your assigned ticket seats. It is a hot, sunny 31 degrees celsius. Note: They DO NOT sell sun cream so make sure you take some or start a weekend business! Sum it up: Super hot, huge crowds, exciting race ?!!! 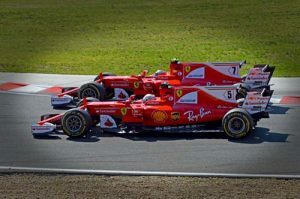 Sebastian Vettel came in first followed closely by team mate Kimi Raikkonen. Valtteri Bottas and Lewis Hamilton respectively took 3rd and 4th positions. We happily accept that, according to Sebastian Vettel himself, the win was due to my husbands wild cheering and thumbs up every time he passed us by! Congratulations on a great race! Quoted from the Formula1.com Post Race Conference, Mr. Vettel said: There was a guy out of the chicane, every single lap he was thumbs up, thumbs up and keeping us going, so it was really great. 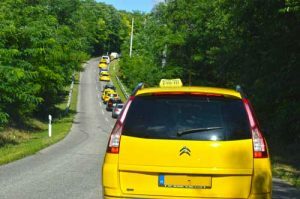 – Dog boarding is within a 20 minute drive of the Hungaroring. See my review of Dogmopolite Dog Boarding. If you have more questions or suggestions, please use the comments section below. 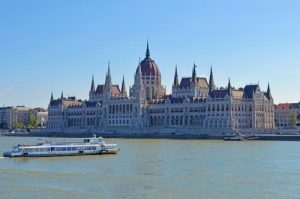 Visiting Budapest? Need a place to board your dog? Following is my independent review of Dogmopolite. Nobody likes to leave their dog in a boarding place, and we are no exception. However, this summer, when we went on a European road trip with our dog Fritz, we found ourselves in need of a dogsitter in Budapest. 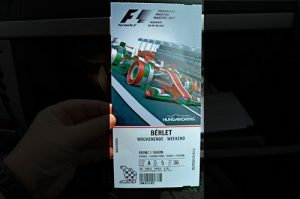 We were in Hungary for the Formula One weekend and Fritz, unfortunately would not be particpating in the racing events. After a little research, my husband decided on Dogmopolite Boarding and Day Care. We arrived and very obviously started asking questions and checking out the large facilities. The young lady in charge, who spoke good english, quickly put our minds at ease as she confidently answered our questions and gave us a tour. There were a lot of other dogs and people were coming and going, dropping off and picking up their treasured pets. There was garden areas, pools, agility courses as well as separate areas for big dogs and little dogs. Private areas were available for dogs that do not play nice. We had to present Fritz’s passport which documented his vaccinations and vet visits, filled out paperwork, answered a series of questions which were recorded and signed papers. Hesitantly, we left our “baby” in the care of Dogmopolite, assured that we could come and go to visit as we pleased. We did not visit, afraid of upsetting a balance, but we did call several times and were always patiently told what he was doing and where he was. When we picked him up, we quietly arrived at Dogmopolite so we could observe how he was handling the situation. He was in the garden playing with some other dogs, tongue hanging out, tail waging! Whew!!! Great place! The only negative was the pungent odour of dog urine, but that happens when there are so many dogs entertaining eachother. Cost: 3500 ft / €11.50 for 3 nights & 3 days.